Psychiatric Tales is an autobiographic work that happens to explain mental illness in a succinct and novel way. It is already proving to be of use to both health professionals and mental health service clients. The book also relates the trauma and personal cost of working in the caring profession, a subject rarely discussed. What makes this work so valuable is that Darryl Cunningham has viewed mental illness from both perspectives: as carer and as a client. This graphic enquiry into mental illness formed part of his recovery yet the work is without a hint of melodrama or self pity, delivered in the neutral tone of an observer. Having experienced anxiety and depression himself, Cunnningham is acutely aware of the discrimination and stigma that mental problems engender and Psychiatric Tales takes steps towards removing that stigma. 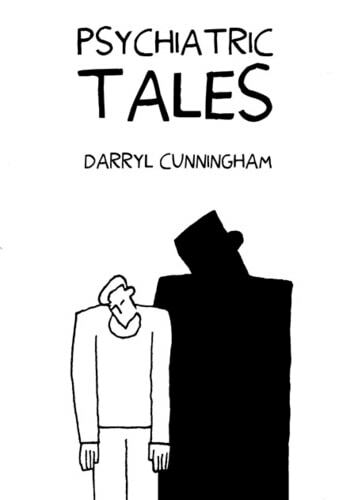 The visual style is trademark Cunningham: blocky black and white panels which use amusing visual metaphors and clever links from panel to panel. Few comics thus far have tackled major illnesses like schizophrenia and organic brain disease or the physical sequelae of mental illness. Psychiatric Tales helps to redress the balance. It focuses on both mental health services within the UK’s National Health Service, the authors experience as a worker within that framework, with chapters on dementia, schizophrenia, depression and personality disorders. Cunningham is positive about his recommendation of treatment with conventional medicines and takes time to explain that drugs such as antidepressants work in a slow and subtle manner, often causing side effects before any improvement is seen. How these agents work is explained at a synaptic level, textbook-style, with diagrams showing the release of neurotransmitters such as serotonin (p21). Darryl Cunningham deserves the success he is beginning to find. This book will undoubtably touch many lives and it seems that his ‘failure’ in being unable to complete his nursing training, may well prove to be a blessing both to himself and to the many readers who will find inspiration and solace in his work.